2000 corvette dash cluster and computer communication? What is needed to make the dash cluster communicate? Hi, I have a 2000 corvette dash cluster and LS1 engine with corvette wire harness and computer mounted in my 1956 Chevy pickup with 2000 steering column. My engine wire harness is from Street and Performance (stand alone 4 wire). There is a ton of wires that are on the original corvette under dash wire harness but I am concerned about cutting what I do not think I need just yet because I do not know what is needed to communicate with the cluster. Can anyone help? See dash picture. Comments for 2000 corvette dash cluster and computer communication? Rely to Chris. Comments - thank you! Hi Chris, thank you for your reply. My goal with this project (2000 corvette dash cluster, 2000 corvette dash wiring, 2000 corvette ECU), LS1 motor)with stand along wiring harness) in my 1956 Chevy pickup is to get basic info from my dash cluster. That being Spedo, water temp, fuel level, volts, tach, oil pressure, that is it for the dash read outs. Your are correct that this unit had a HUD but I do not plan to use it. Windshield on a 56 truck is at an extreme angle anyway. In addition to this corvette equipment I have on my truck, I have 1981 corvette rearend narrowed 6 inches on each side and custom built trailing arms to handle the 12 inch wide and 20 inch tall tires. Front end is non corvette but has tubular A arms IFS with rack and pinion steering, with coil overs. As for the 2000 corvette steering column, my plan is to keep my 1956 dash "smooth" so not to mount anything in it. I need to figure out the wiring pin outs in the column to use the following items on the corvette column (windshield wiper switch, turn signals, high low beams, horn, head lights/running lights). Thank you Again for your comments, George. You project is very cool! But a little outside of what we normally can provide for info, but I will do my best to help you out. I'm also not sure of all your project goals or components so I will do my best guess to hopefully get you in the right direction. First I would say you will need a matched ECU and Body control module. This would be best with a donor car that includes all the body wiring harnesses. While your at it see if you can get the Heads up projector also and work that into your dash so you can get the proper angle. The reason I say this because your cluster appears to have the HUD controls. You will need custom tuning to turn off lots of faults triggered from the ECU missing all of the inputs. Not sure if you are using corvette powertrain but the only way to get vehicle speed is from the wheel sensors. I'm not aware of any work around for the speed sensors. 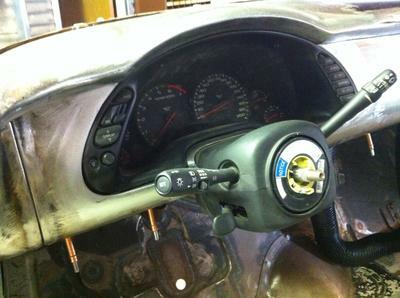 Remember to pull the bulbs out of the cluster for the airbags and seat belt.